Non-destructive testing from FIRST – ensures the safe and efficient operation of your equipment and assets by detecting defects before they result in severe damage, and assures compliance with international standards. From construction and Petroleum sites, pipelines and refineries to shipyards and nuclear power plants, you need to monitor and improve the reliability of your processes and equipment. Our non-destructive testing (NDT) services offer you complete or sample examination of your assets, using well-designed procedures and highly trained and certified NDT inspectors. As a result, we can provide you with complete and valuable data, enabling you to make informed asset management decisions. Why choose non-destructive testing from FIRST? 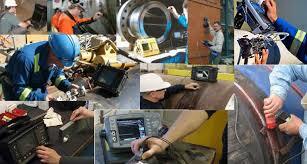 we are a non-destructive testing provider that you can trust. For your complete peace of mind, our qualified and certified inspectors provide NDT in accordance with international standards. Best of all, with an NDT network, we can provide world-class non-destructive testing expertise and a local service, close to your operations – wherever and whenever you need them.